1. Preheat oven according to directions. Grease and flour your loaf pan. 2. Prepare the first pound cake batter and add food coloring until you achieve the color you want. 3. Pour batter into pan and bake 8-10 minutes less than the directions call for. 4. Let cool for 5 minutes. Remove from pan and set on a wire cooling rack. Set in refrigerator to cool completely (up to 4 hours). 6. Cut out shapes from slices with the cookie cutter. Set off to the side. 7. Prepare the second pound cake without the food coloring. 8. Grease and flour the pan. Pour just enough batter to cover the bottom of the pan. 9. Place the cut-outs down the center of the pan, but make sure to keep them tightly together. DM TIP: I placed the pan at a slight angle. I then placed some batter on the lower side and placed the cutouts into the pan. Once they were in, I placed batter at the other end, placed flat on the counter and filled in the sides and top. 10. Pour batter over the cut-outs. Be sure to cover the top and sides, but don't let it overflow. 11. Bake according to directions. Let it cool completely when done. Add flavors! 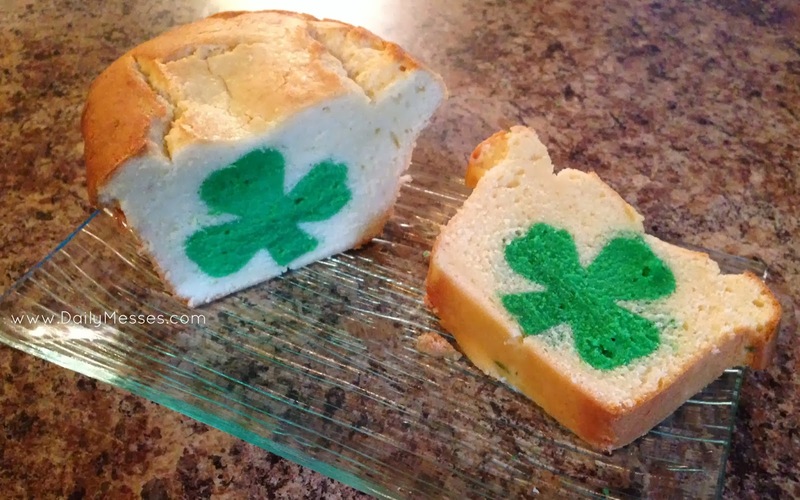 Add a mint or peppermint flavor to the first pound cake for St. Patrick's Day or Christmas. Add cocoa to make a chocolate pound cake. You could even find a baby bottle or carriage cookie cutter and make a gender reveal cake for a baby shower!